Makita DTD152Z Impact Driver Makita DSS611Z Circular Saw Practical Output (18v): 3.5W x 2. Cordless impact drill 18V. 1 x DUB182Z Blower. Twin LED Job light with pre-glow and afterglow functions. Rubber Cap securely fixed to Stopper Base for accurate positioning and slip prevention. DCS331 JIGSAW WITH DUST SPOUT. DEEP TSTAK CARRYING CASE. DCF887 BRUSHLESS G2 MOTOR IMPACT DRIVER. Latest generation premium Jigsaw featuring new XR Lithium Ion Technology. 2 X DCB184 5 AH LI-ION BATTERIES. 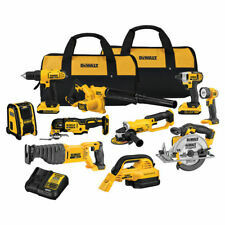 Dewalt DCK699M3T 18v XR 6 Piece Kit with 3 x 4.0Ah Li-Ion Batteries, Charger and 2 x T-Stak Cases The DEWALT DCK699M3T XR 6 Piece Kit, contains the following: 1 x 18 Volt DCD795 Brushless Compact Hammer Drill has a lightweight, compact design for use in confined spaces. With 2-speed, all-metal transmission and LED work light. 1 x 18 Volt DCF886 Brushless Impact Driver with brushless motor technology, aluminium front housing and an ergonomic handle. 3 LEDs provide work piece illumination. With 'drop in' keyless hex driver for a quick, one-handed fitment. 1 x 18 Volt DCH253 SDS Hammer Drill is ideal for drilling anchors and fixing holes into concrete, brick and masonry from 4mm to 24mm. Has a rotation stop mode for light chiselling in plaster, tiles and render and an impact stop . Latest generation XRP featuring NEW XR Li-Ion technology. Powerful & Highly efficient DEWALT PM47 fan-cooled motor with replaceable brushes. Aluminium front housing provides greater heat dispersion increasing motor life. 2 x TOUGHSYSTEM™ DS300 Toolboxes. Brushless Motor Technology for excellent efficiency. 18V Brushless Motor. Dewalt DCF887 Impact Driver High power Brushless motor outputting up to 205Nm of torque ensures heavy applications are completed quickly. Warranty info. DHC253 SDS drill & DCS331 jigsaw. 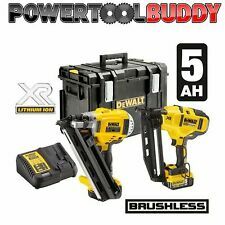 Compatible with all DEWALT XR Li-Ion 10.8V Tools. Built in LED light that lights the work area. Reinforced aluminium head, both lightweight and durable. Best in class ergonomic forward handle for optimal centre of gravity and improved balance, reducing operator fatigue. Bosch 0615.990. K9C 18v 6pc Combination 4.0Ah Kit. 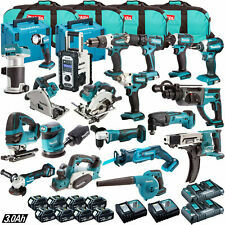 TheBosch Professional Combination Kit has everything a Tradesman could want. A selection of 6 of the more popular Power Tools in the Bosch 18v Cordless Range. Milwaukee M18FPP6B-503B UK 18v Li-Ion Cordless 6 Piece Kit - 3x 5.0Ah Batteries Heavy Duty Tool Bag. SPECIFICATION OF 18V MILWAUKEE M18FPD-0 COMBI DRILL. SPECIFICATION OF THESE 18V MILWAUKEE M18FID-0 IMPACT DRIVER. DEWALT DCF887. DEWALT DCD796. Dewalt DCF887 18V XR Brushless Impact Driver 3 Speed 1 x DCB182 4ah Battery. Dewalt DCD796. DEWALT DCH 253. Compatible with all DEWALT XR Li-Ion 18V Tools. Beats per Minute: 0-9350/34000 bpm.